January 10, 2018 — Sick crops? These Indian subsistence farmers know just what to do: Pull out their smartphones and take their picture. The farmers then upload the images with GPS locations to a cloud-based artificial intelligence (AI) app named Plantix. The app identifies the crop type in the image and spits out a diagnosis of a disease, pest or nutrient deficiency. Plantix also aids farmers by recommending targeted biological or chemical treatments for ailing plants, reducing the volume of agrochemicals in groundwater and waterways that can result from overuse or incorrect application of herbicides and pesticides. “Nearly every household in India has a smartphone, and many want to see how Plantix works,” says Srikanth Rupavatharam, a digital agriculture scientist with the International Crops Research Institute for the Semi-Arid Tropics (ICRISAT) in Hyderabad, India, which is collaborating with Plantix’s developer to adapt the tool for Telugu and Hindi languages. For common crop diseases in India, Rupavatharam says, the app has an identification success rate of more than 90 percent. Plantix is based on deep learning, one of today’s most powerful AI tools. Deep learning involves neural networks — digital imitations of the human brain’s system of neurons and synapses. Deep learning models are trained to look for certain patterns in giant datasets. They also go beyond basic pattern recognition to devise their own rules as they go, deciding how best to perform their jobs. 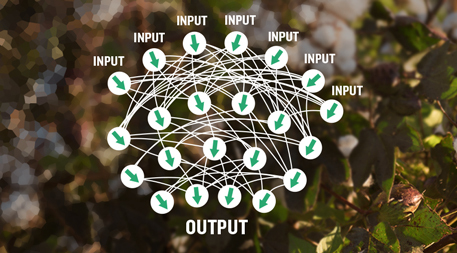 In deep learning, a rapidly advancing form of artificial intelligence, data (inputs) are fed into neural networks that can discover how to detect patterns and make predictions and recommendations (outputs) on their own. Illustration by Sean Quinn. Deep learning isn’t a new idea; it’s been around for decades. But over the past five years, deep neural networks have advanced very rapidly because of super-fast processing hardware and huge volumes of data from the internet to train models. Deep learning already reaches into our daily lives: Facebook, for instance, uses deep learning to identify and tag the faces of our friends in posted photos. Now ag-tech companies are testing deep learning as a tool to boost productivity and reduce environmental impacts while helping farmers carry out tasks that people now perform. As in every other industry, AI advances could lead to greater efficiencies but also job losses. The world must produce at least 60 percent more food relative to 2006 to feed an estimated global population of 9 billion by 2050, according to United Nations figures. But most arable land is already cultivated, so farmers must find ways to grow more food on the acres they already cultivate. To improve farmers’ efficiency, researchers are experimenting with deep learning models that help guide robots and drones in monitoring fields for pests and predators, tracking crop and livestock diseases, and many other tasks. Ag-tech companies are testing deep learning in robots to identify the “faces” of fruit and pick them more rapidly. Someday, a farmer in a developed country could remain in an office all day remotely deploying AI-driven machinery. As exciting as applications are, they are not without challenges.As exciting as such applications are, they are not without challenges. 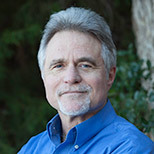 Deep learning has proven successful in highly structured, predictable environments such as those involved in medical care. Farms, though, are far messier places. “Agriculture is a little behind in adoption of advanced digital tools,” says Shriram Ramanathan, who heads the big data analytics practice at Lux Research, a technical innovation consulting firm. “Deep learning models have improved a long way, but once you go outdoors, there are so many factors that can affect their accuracy.” Lighting conditions, shadows, weather, dust and other factors outdoors can change by the hour. A plant can look quite different at dawn, noon, or evening. If poor-quality images are fed into a deep learning model, the algorithm is more likely to misidentify the plant or its ailment. That said, two small companies, California-based Abundant Robotics and Israel-based FFRobotics, are racing to develop the world’s first apple-picking robot guided by deep learning. 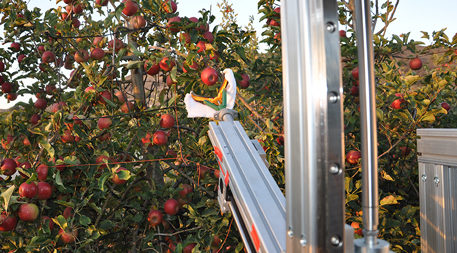 Mounted on tractors, these machines use cameras to recognize individual apples and robotic arms and other devices to gently pick them from trees. Abundant Robotics field-tested its apple-picking machine in Washington state orchards in 2017. FFRobotics tested a machine in Israel over the past three years, and plans to test in Washington state in 2018. Part of the rationale behind the rush is political. Apple growers face financial disaster if fruit isn’t picked on time. Nearly one-fourth of Washington’s seasonal agricultural workers arrive on H-2A (temporary agricultural worker) guest visas, mostly from Latin America. Growers worry that future federal policies will reduce their seasonal workforce, motivating interest in robotic replacements, says Karen Marie Lewis, a Washington State University tree-fruit horticulturist. Some major agricultural companies and high-tech subsidiaries are betting on deep learning. Deere & Company spent US$305 million in September 2017 to purchase Blue River Technology, a startup based in Sunnyvale, California. Blue River has developed a tractor-mounted device called See & Spray that deploys two color cameras, computer vision and a deep-learning algorithm to detect weeds and cotton plants in milliseconds and spray herbicide just on the weeds. To train its algorithm, Blue River Technology fed it accurately labeled, high-resolution images of cotton plants and weeds at various times of day. “The algorithm has to be very robust to account for different field conditions,” says Lee Redden, the company’s co-founder and chief technology officer. The more images that the model “sees,” the more accurate it becomes in recognizing plants. The model’s first computational layers detect simple elements in plant images such as edges and corners. The next layers can bring together corners and edges to form features such as leaf margins. Each successive layer of the model builds on the knowledge of the previous layers. The software becomes increasingly expert at recognizing features that the programmers instruct it to look for. When the model misidentifies a plant, the programmers flag the result and adjust the model. If the training goes well, the model is tested. Can it accurately identify a plant in an image it has never seen before? If the model passes, the algorithm can be tested in the field. By differentiating weeds from cotton plants, the machine allows farmers to transition from broadcast spraying to a more targeted application, reducing herbicide usage by 90 percent, says Redden — saving money and reducing pollution. The results for the See & Spray device are promising, says Redden. By differentiating weeds from cotton plants, the machine allows farmers to transition from broadcast spraying to a more targeted application, reducing herbicide usage by 90 percent, says Redden — saving money and reducing pollution. Blue River tested two machines in 2017 and is planning to test 10 machines full time in commercial cotton fields during the 2018 growing season from Georgia to West Texas. 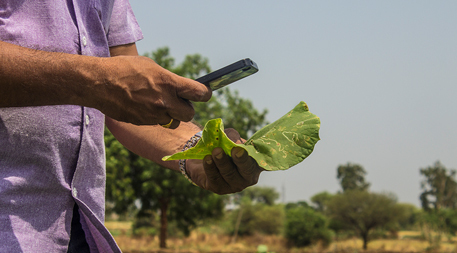 “We see a lot of unnecessary spraying of pesticides and overuse of fertilizers,” says Rupavatharam of ICRISAT, which teaches agricultural extension officers how to use the Plantix app. The extension officers, in turn, reach out to farmers. With Plantix as a guide, farmers can identify weeds and pests more accurately and earlier in the growing season, allowing them to slash insecticide and herbicide use, reduce damage to wildlife and human health, and minimize issues related to resistance to pesticides, Rupavathram says. Broadband access is not required to use Plantix. In the field, users can look up crop diseases and solutions stored in the smartphone app’s library. The app’s database holds more than 270,000 labeled images of some 400 diseases or pests, including about 20 that afflicted rice, peanut and pulse crops in central India in 2017. Plantix has about 300,000 active users a month, primarily in India but also in Brazil and North Africa. Plantix has about 300,000 active users a month, primarily in India but also in Brazil and North Africa. They include not only farmers but also those who advise them. “For extension officers, Plantix is like a great treasure in their hands, a refresher course for them,” says Rupavatharam. UPDATED 01.29.18: The name of the entity acquiring Blue River Technology was corrected.